Okay, y’all. There is a radio station in Little Rock that starts playing Christmas carols on November 1. Naturally, I’ve been listening since then. I have heard Eartha Kitt’s “Santa Baby” approximately two million times, and I’m pretty sure she has it wrong. I don’t need a yacht. Or the deed to a platinum mine. But boy, as a mom, I have a long Christmas list for Santa. 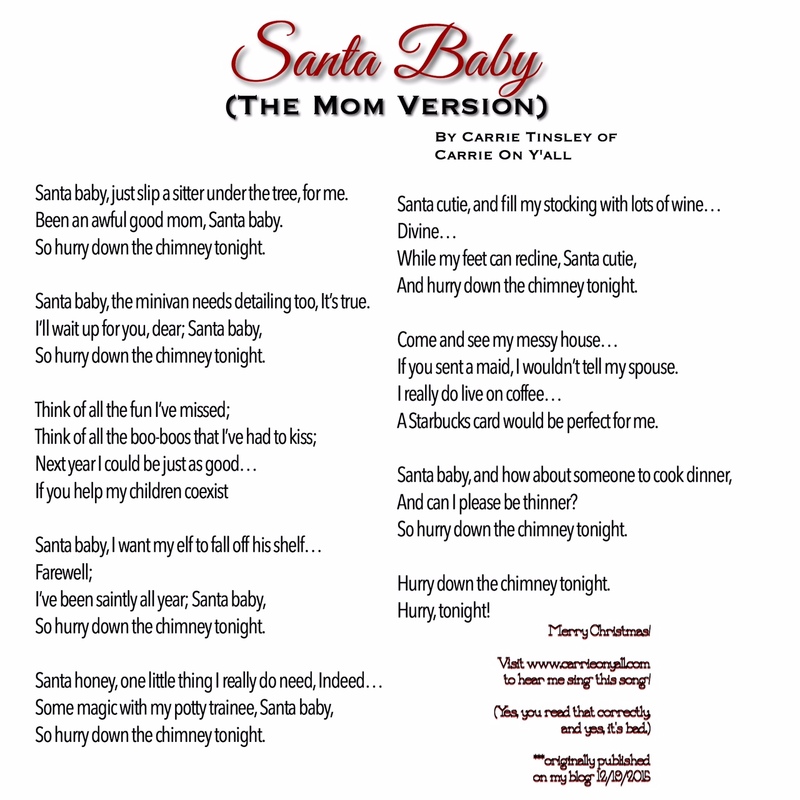 So…because I’m not afraid to make a fool of myself in the name of comedy and Christmas spirit, I have written and recorded “Santa Baby: The Mom Version.” Enjoy, y’all, and please hook your mom friends up with some of these gifts! Santa baby, just slip a sitter under the tree, for me. Been an awful good mom, Santa baby. Santa baby, the minivan needs detailing too, It’s true. If you sent a maid, I wouldn’t tell my spouse. A Starbucks card would be perfect for me. And can I please be thinner? PS–I am NOT a singer, and yes, I totally know how bad I am. But I’m also pretty sure that Carrie Underwood may record this on her next album. Love it! So clever and I think you inherited your mom’s musical genes! Thanks, Helen! I’ve hardly inherited musical genes. Just musical enthusiasm (two VASTLY different things).? This made my night! Merry Christmas!